Doom got ported to so many systems after its initial release that it started becoming something of an industry joke. In fact, it’s still being ported to this day (now appearing on Xbox Live and your cellular phone). I bring it up because, on initial review, a Jaguar port of Doom seems a bit like a waste of time. However, it’s important to remember that not everyone had access to a PC in the early 90s. Those that did frequently had but one “family computer” with such exciting software as WordPerfect, Lotus Notes, and some absolutely revolting educational titles for the kids. If you were allowed to play something like Doom on the same computer as your family’s tax records, then your parents were far more chill than mine. So wanting to play Doom was yet another reason I wanted a Jaguar. If I had succeeded, I can safely say that I would not have been disappointed. 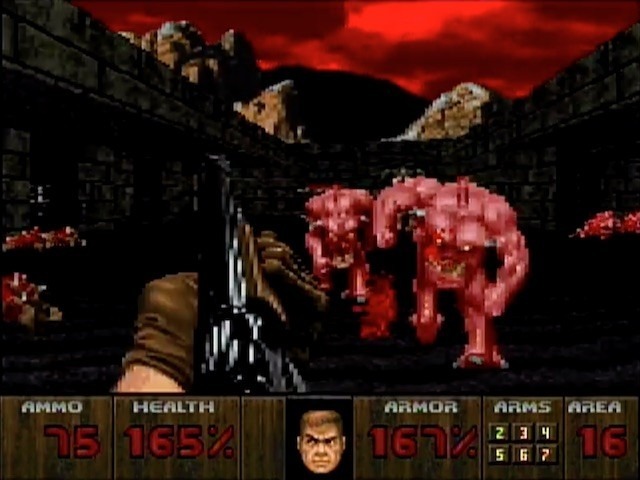 Jaguar Doom certainly holds its own against the competition, and would really be trumped only by the Playstation release (which featured all monsters, all levels, and Doom II as well) a year and some change later. That’s a fair run to be at the top. It’s still a port, so it can’t stand up to the PC original. But if you have to play the game on a console, this is a perfectly suitable method. What you get here are 24 levels (one hidden) from the three original Doom episodes. Ultimate Doom levels or anything from Doom II are not included. The architecture of the ported levels generally mirrors the PC version, though every level seems altered for console optimization. Changes can be as insignificant as removing a door and some pillars, cutting down the number of stairs, or raising the sunken pit around the level exit switch in the second level. More complex levels see entire sections of the level removed, such as the rooms leading to the red key in Central Processing being replaced with a platform that just gives you the key outright. The larger the level, (especially later ones, like Pandemonium) the more likely parts of it have been removed. These kinds of changes are noticeable if you’re familiar with the levels, and probably impossible to detect if you’re not. I only noticed on direct, back-to-back comparison with the PC version, and aside from some areas that seem oddly easy (usually because a crushing ceiling trap was removed), things don’t seem out of place as you play. What you absolutely will notice is an obvious blandness in most areas. Most decorative architecture is removed, so you’ll get awkward open areas or empty corners of rooms where a tree or a hanging limb would have been in the original. Textures are reduced as well, with a meager limit of 16 different textures per level. This means most levels share rooms upon rooms of identical tiled textures in places where the PC attempted some variety. I can’t really say that anything is missing, because none of these issues affect the gameplay or the coherency of the levels. Even the fact that you’re missing five levels from the PC version isn’t a big deal, and I couldn’t even tell you which ones were missing without looking it up. I would consider myself a fan of the original, and I’m not feeling particularly uppity about these differences and cuts. It’s all just typical game port compromise. There are two console-exclusive levels. These used to be Jaguar-exclusive, but subsequent console ports would use the same modified levels created for this version, plus the two new maps as well. These are new Hell levels at spots 16 and 17, and steal names from the PC despite having different layouts. “Tower of Babel” is the first exclusive, and no longer has you chasing the Cyberdemon. 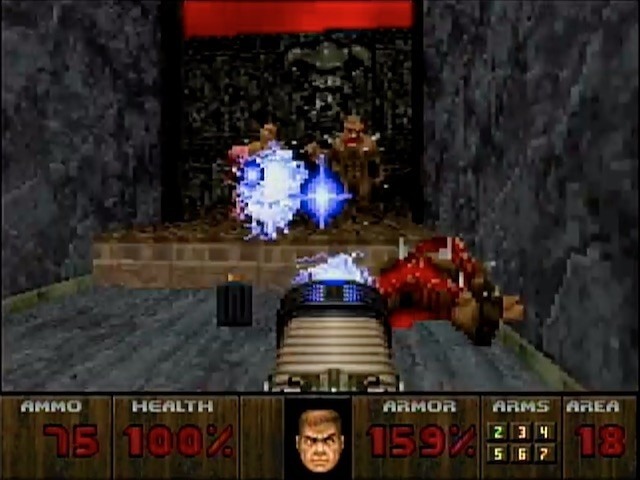 Instead, this version a short arena-style level where doors open in sequence around a central point, and enemies of increasing difficulty swarm. It mimics “Dead Simple” from Doom II. “Hell Keep” follows immediately, and this version is a fairly basic keycard hunt in a level overusing the stone and brick textures. Nothing particularly memorable, and I wouldn’t have recognized it as a new level if I hadn’t looked it up. You have all the weapons from the first Doom, with no modifications and nothing new to add to the arsenal. The enemy list cuts out the Cyberdemon and the Spider Mastermind. I do miss these boss battles, but I assume they were axed because they took up a lot of room for only appearing once or twice. Here, you won’t see anything tougher than a Baron of Hell. 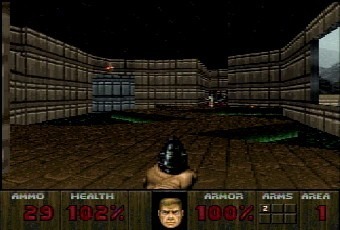 The final level is the secret level “Fortress of Mystery” renamed to “Dis,” and the game simply ends with a “salute” from id Software. No final boss fight. The Spectres have also been removed, I assume because the Jaguar wouldn’t do the blur effect, or likely because space was an issue and the Spectre was just a rehash of the pink Demons. Every other enemy is present and accounted for, with weapons, abilities, and gory deaths intact. No censorship cuts of any kind have been made, though most of the beating hearts and mangled corpses are gone with the rest of the decorative textures. The Jag port handily throws the PC’s legions of enemies at you. The major gameplay change is to the saving process. Levels no longer come in episodes. Instead, you select the number of the level you wish to play from the title screen. Only the levels you have passed are selectable (provided you haven’t cheated) making it easy enough to pick up where you left off. The game will automatically add the cleared level to the level list and requires no thought on your part. However, this also means that you cannot save anywhere you like, or in the middle of a level. It also means that you’re going to have to think more about playing each level from the beginning. If you die within a level, you’ll return with the equipment you had at the start of that level for as long as the system’s power stays on. If you turn the console off and pick your last level from the start menu, you’ll start that level with only the pistol. All levels are designed to be playable this way, it’s just that the PC version’s permanent saving system made this restriction frequently ignored. Doom sounds pretty good – I would say comparable to the PC version. Howls and gunshots sound just like I remember them, right down to the eerie chirp of nearby Imps. I did notice that the variety of sounds has been reduced. Zombies in particular had about three different versions of a death groan, where here they reuse the same one every time. There’s also no music in-game. The reason for this is disputed, because the music has been converted and is on the cart – you hear full versions at the score tally screens between levels. They don’t sound great, but they’re perfectly useable. I’ve read that it’s a technical limitation, and I’ve read that it’s a creative choice, but the reasons don’t really matter.. As it is, the levels work fine without music and afford you a sharper ear to listen for awaiting monsters. The Jaguar pad handles control surprisingly well. You won’t get the PC keyboard’s sharp, precise movements, but you can easily make your way through the entire game with the controller. Turning and movement are mapped to the D-Pad, and turning becomes strafing with the C button held down. B shoots, A runs, and C opens. The number keys select the various weapons, which actually turns the Jaguar’s cumbersome numpad into a real benefit. You can now switch weapons as quickly and accurately as you could on the PC, without having to cycle through them as on other consoles. The 9 key activates the minimap. The colors can be a bit hard to understand, and you are just looking at a design view of the level, but your ability to zoom and move your character around can be invaluable for navigating mazes. 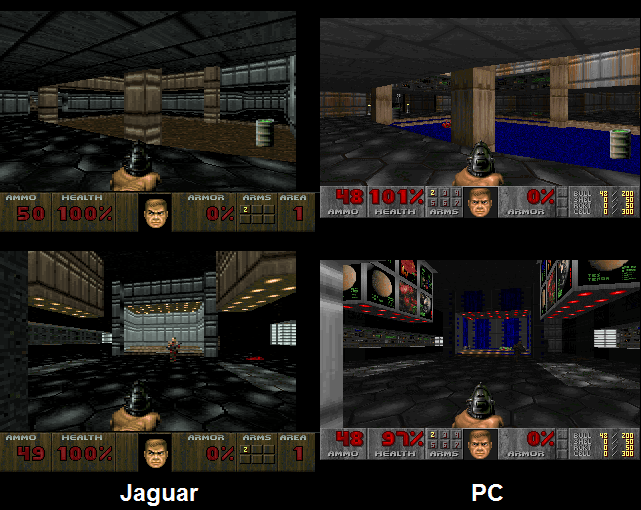 The major reason to have sought out the Jaguar version is its ability to play the game fullscreen, at a resolution that could hold its own against the PC. Other ports, even for years to come, couldn’t make that same claim. Blockiness exists, but is comparable to the original. Some framerate stuttering occurs in high-traffic, high-action areas, but this was present in the original as well. Textures haven’t received an overhaul, but still look clear and comparably sharp. Lighting effects are present, with flickering, fading, and variable levels of brightness; all key to creating the mood of the levels. There are no visual controls to increase contrast or the visibility of dark areas, and this is quite a dark game, so some adjustment of your TV may be required. Monsters look identical to their originals and just as menacing. They still explode into meaty red pulp when hit with the appropriate weapons. On a minor note, but still worth bringing up, Jag Doom was the only console version at the time of its release to include multiplayer. 2-player deathmatch and co-op were available if you met the hefty requirements of having two Jaguars, two copies of Doom, and two functioning Jaglink boxes. Having not played either multiplayer option, I can’t really comment on them – except to note that the manual itself tells you to expect occasional network errors, and blows them off as “the interference caused by playing a game in Hell.” That’s probably not a good sign. It would again be trumped by the Playstation version, which also had this linking ability along with much more content. Regardless, the fact that the Jag was the only console in 1994 that was able to include a functioning multiplayer mode (with promised modem networking that never materialized) is deserving of a thumbs-up for technical achievement and forward thinking. It’s also worth mentioning that the game did crash twice around the same point in level 3. It freezes, puts up a bit of code, and forces you to restart the console. I was able to finally finish the level and never encountered a crash again, but it should be noted that they do exist and are possible. You probably won’t ever run into one, but don’t assume the cartridge format somehow makes you immune to software errors. It’s only recently that console ports have been expected to have some form of unique content or a reimagining of its computer-based original to make them worth purchasing. In 1994, it was enough of an accomplishment simply to have a cheap(er) console accurately play a game designed for the PC. That’s what you get with the Jaguar port; nothing more, nothing less. 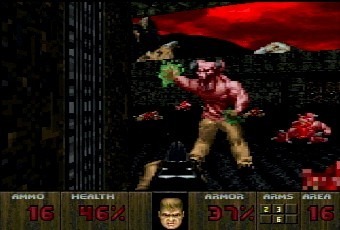 The PC original still feels more polished since it was the intended and designed system, but if this was your only option, it was and still is a great way to play Doom. Looks about as good as a PC; fullscreen on a console and everything. Weapons, monsters, and gore all transferred unscathed. Most levels have been slightly redesigned and simplified. Noticeably fewer textures. Level music is no longer an option. Five levels didn’t make the cut.